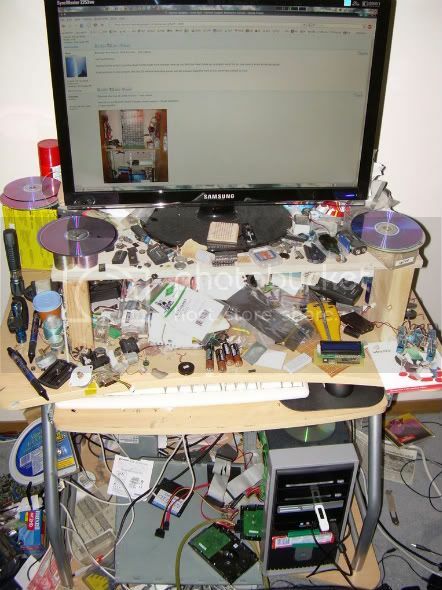 To enter the Hacked Gadgets Workbench Contest add one or more pictures of your workbench to this thread and describe what is great about it. Got a question? Ask in the comments area here. Have you built some features into your bench that saves you tons of time? Share your creations with the rest of us so that we can all build and hack a bit easier. If there are some items that you would change on your existing bench please let us know so that we don't make the same mistake when we set up a new bench configuration. The contest will run from September 6 - October 31, 2008. The winner will be the entry that provides the most useful information. The prize for this contest is a 4GB iPod Nano. First 20 entries will get a loupe magnifier shown below. If you don't have a workbench you can still enter by sketching up what you would want and describing what features would make your creation special. I'll get the ball rolling. My bench is probably not spectacular, but it suits me just fine Before I set this up if I needed to make or hack something, I had to drag all my gear out of cupboards. I don't have access to a shed or basement, my garage has been converted to a home office and that is where my bench lives! The desk and floor draws came fom IKEA and the component draws from Wickes (UK readers will know this place). I needed to keep it in line with the furnishings of the rest of the office, and it fits in nicely. It also uses up some "dead" space behind the door which used to have a under-used bookcase in it's place. Here are some other shots of the room, technically everything in here is part of the bench as I do coding and design at one end, and building at the other. The design end, I have 3 24" Dells and a 15" touch screen. Coding and design does need alot of screen space. I do sometimes run out of space on this lot! The printer rack. 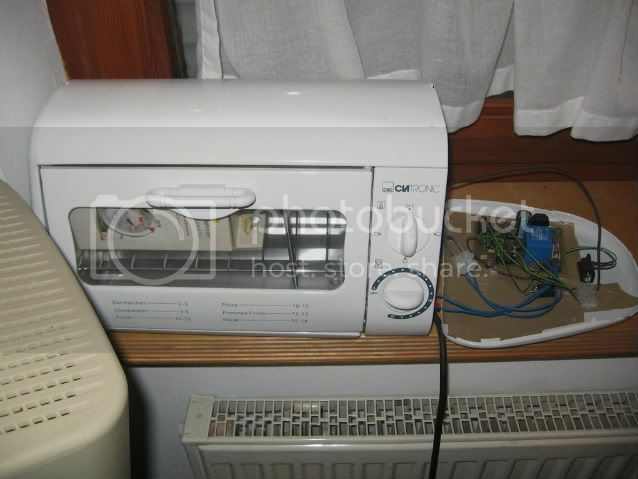 Out of all these my OKI DP5000 (ALSP MD5000) is the greatest printer ever. White, metallic and foil inks! More storage under the main desk. And finally a shot of the "building end" of the room. Probably the cleanest workshop ever I am building a room at the back of the house where I can cut wood and spray stuff etc. 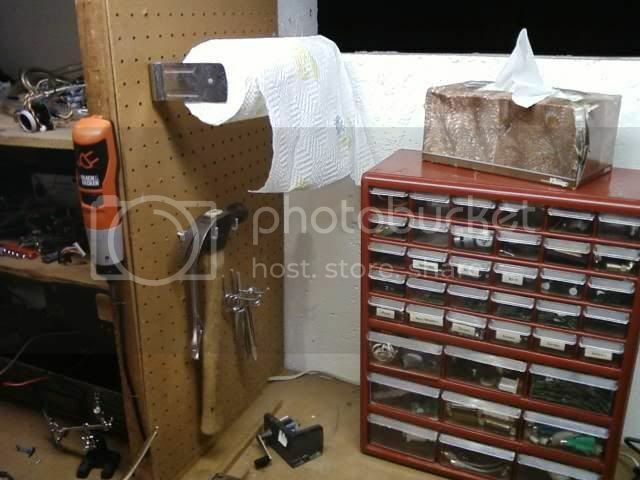 Here is my workbench corner in my garage. There is much more to the garage (which includes my tool chest, air compressor and storage shelving), but this is where most of the work is done. This part and the rest of the garage has 2x4ft 5000K fluorescent lights. There is one directly on the ceiling of the workbench to provide nice and even lighting. A small lamp sits to the right when I need more local light. 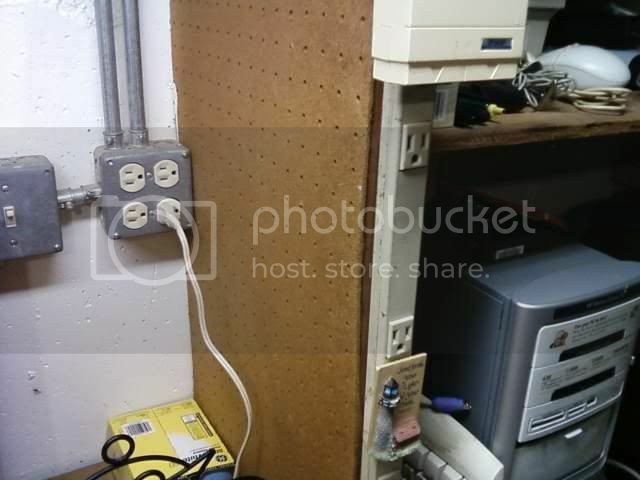 There is an electrical outlet directly at the bench (visible in the photo), and one behind the server cabinet. Under the bench there is one more with a surge protector, and one more surge protector on the right side of the bench. For the most part it's just my Fluke DMM... I know, I know, I need more equipment, but I haven't had a chance to invest in anything else. Lame! My bench power supply comes from a 400W ATX PSU. Gives me access to ample amounts of power in 12, 5, 3.3V (as well as the negatives, of course). The obvious storage containers on the wall hold all my components and parts. Larger electronic parts are in individual containers on the garage shelves not pictured. 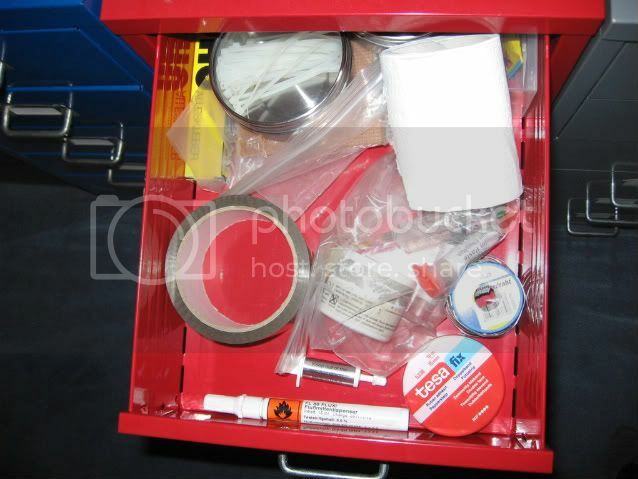 There are some commonly used computer parts in the rolling cabinet on the left side of the photo. The drawers were purchased at Home Depot for about $20 for the large one and $10 for the small one. The red bins are I think $4 for a set of three. 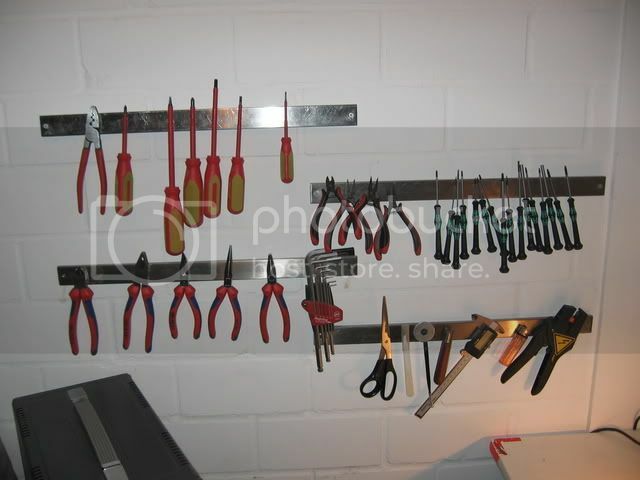 One of the most useful storage devices is the tool rack. It's basically just a plastic piece with holes and cut outs for tools to rest in. Got it for $1 on eBay, very happy with that purchase. Bench was custom made by me using nothing but 2x4s and some 1/2" particle board sheets. The actual surface was a formica laminate top I picked up at home depot, cut with a Dewalt circular saw and glued on with 3M 777 spray adhesive. Another obvious thing is the PC that I use in my garage, and in the second photo my 7ft HP server cabinet loaded with lots of machines, pull out LCD + keyboard and switches. Wall on the left was built by me as well.. same with the drywall and painting. 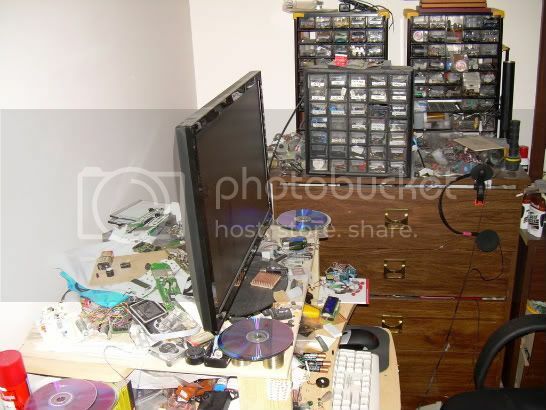 Wow what a neat and clean setup. Looks like everything has its place! What type of cutting board are you using? That is a great idea that I have never seen on a workbench before. Small addition to the contest, the first 20 entries (including yours) will get a loupe magnifier sent to you when the contest is over. Thanks for the entry! Love the clean home made work surface. How do you find the finish holds up to project work? Or do you cover it when soldering gluing? 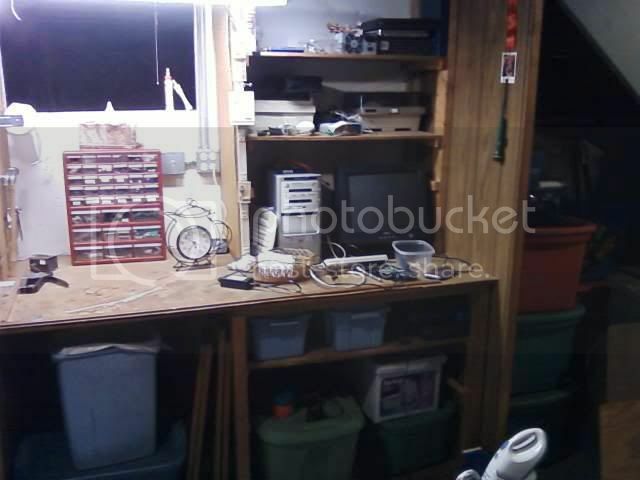 Here is my workbench inside a closet. Small houses = Smart solutions. Mine is more of a computer desk but I use it as a work bench. And it's a Terrible Mess! To solder I'll pull out the keyboard table and move the keyboard back. My soldering iron is under my chair on the floor. Thanks for the kind comment! The finish is extremely resilient (which was surprising to me, actually). I had a choice between black and white, but I figured a black finish would make it difficult to find parts on the surface (although it'd look nice). When I solder or anything rough, I typically use an old plastic cutting board (one of those white ones that appears translucent) on top of the bench. This way I'm not worried about messing it up in case I slip. Cleaning it is also very easy. I typically take a damp paper towel and put some OrangeGlow (the hand cleaner, from a pumpable tub) on it and wipe it down. Leaves the surface VERY clean. One thing that bugs me about the desk is the front piece of laminate. I had enough to do everything, but the piece I left was accidentally broken and I had to fashion it from two equal length sections (you can see the black line in the middle). But other than that, everything else worked out well. I also got a GREAT deal on the laminate. Home Depot originally wanted $60 for the sheet, but since it had a pretty nice crack on the edge, I asked for a discount and ended up getting it for $25! My name is Konstantin.I'm 22 years old, live in Germany and study mechanical engineering (mechatronics, to be precise). I recently renovated my basement and build a new workbench. My room was just to small to fit everything in. Now i finally have enough space for all my tools and parts, which significantly speeds up projects. 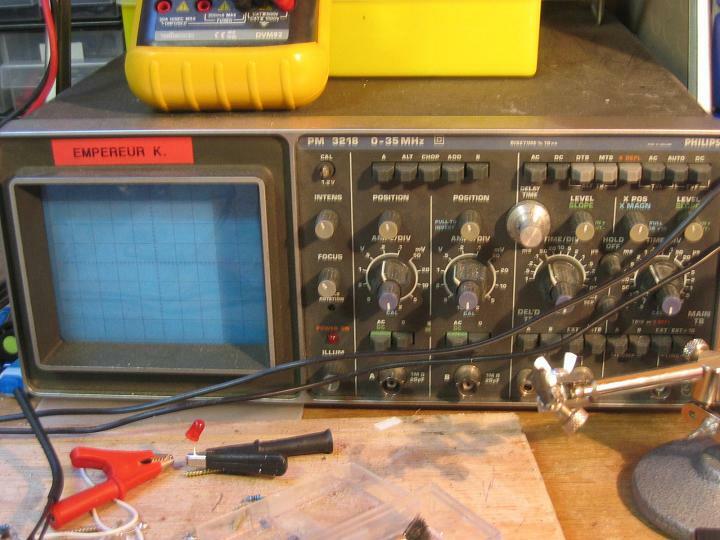 An old Hameg HM312 1-Channel oscilloscope. Bought it about 10 years ago in used condition, but it works well. Some cheap multimeter from eBay. My old one had no capacity-meter and did not beep in conductivity mode, so i bought this one recently. Also has an internal an external temperature sensor and frequency counter (which seems not to work properly). Essential tool for measuring, especially for parts to enter them into the eagle-library. Temperatureregulated soldering iron without temperature display. Some fine tips for SMD-soldering and some bigger ones for bigger parts and desoldering. Needles and scalpels for scraping of excess toner from ironed layouts and brushes to remove fluxresidue. One goose-neck magnifing glass for SMD-soldering and two lens-assemblies from old scanners, which provide very good magnification for inspection of etched boards. As the name implies, those are quite helpful in holding the boards while soldering the parts. Never can have enough of them. 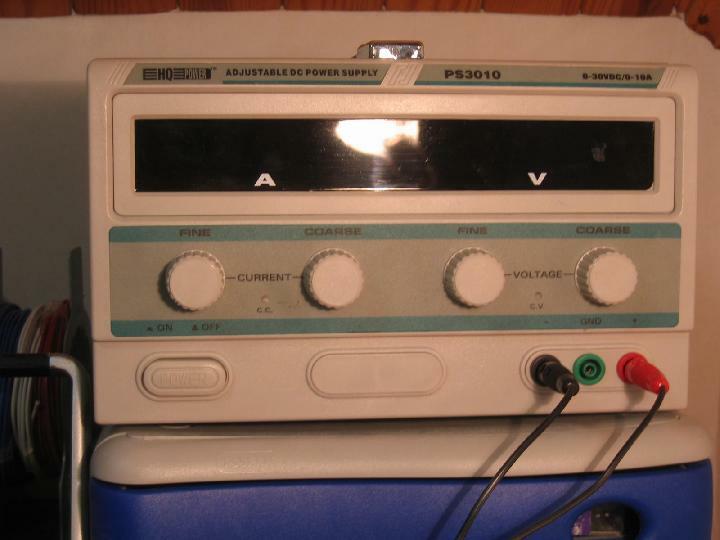 Dual output laboratory power supply. 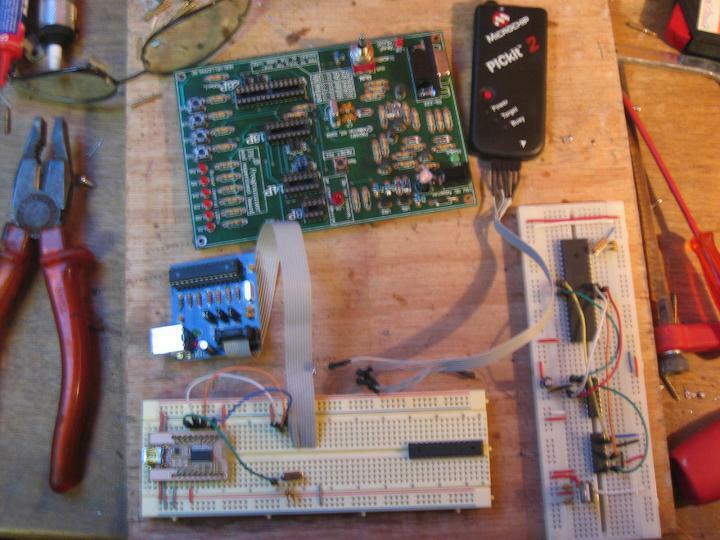 555-based squarewave generator with adjustable frequency and dutycycle as clocksource for breadboard-projects. One big breadboard for big projects, a smaller one for quick test circuits and one as interface for the AVR-Evaluationboard. A board which can house some different kinds of AVR and provides some basic I/O (2 Leds, 3 buttons, piezobeeper, rs232 and ISP) and one big port where all I/O pins are available for external circuitry. 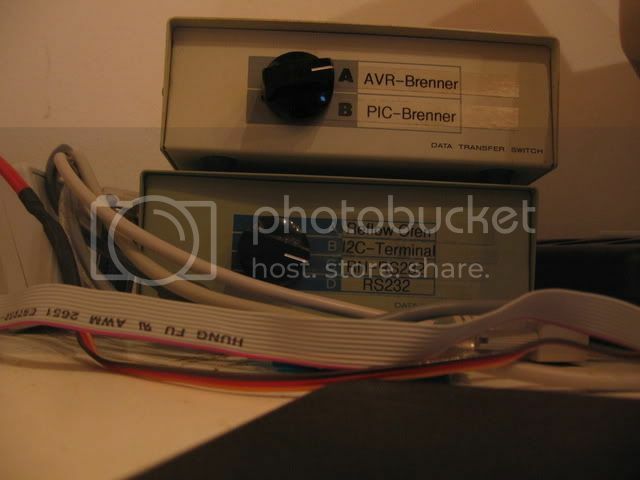 The ISP-Programmer is connected to the PC via USB and can be used from within AVRStudio. Some old P-III box with 128Mb of ram and a 4GB SCSI-Harddrive running Win98se. Win98se does not prohibit direct access to the parallel- and serial-port, so it is ideal for testing. Runs AVRStudio, TurboC++ and QBasic. (Second PC with Linux waits for a kvm-switch). Homemade socket panel with 5 switchable 12V outlets, 5 switchable 5V outlets, 6 extensions for power, 1 extension for oscilloscope, 1 extension for D-SUB25 and connectors for the parallel/serial ports of 2 PCs. Saves a lot of cable tangle and makes everything accessible directly on the table. Separate table for chemistry stuff and etching circuitboards. Metalplate and glassplate to protect the table. The cable-canal-top is mounted to hinges for easy opening and adding/removing cables. You can see the left panel (which is not finished yet. )For lightning i use a flexible lamp which is currently broken (stupid plastic). Under the table you see the cnc-control rack and the 2 pcs. The monitor has a wallmount to save space on the table. Under it sits an old laptop. It hasn't THIS ONE ULTRA SPECIAL FEATURE, but i like it very much and it has been testet for about 8 years. I will refer to the main picture and describe some sub-systems of the hole thingy. On the left you can see 3 containers of a very famous sweedish furniture store. They are full of all those Resistors,Capacitors,LEDs and whatever you need. The parts are all stored in seperated boxes. I can't take a picture of all of them. But here is the capacitor box. The wall next to the table is full of tools attached to magnetic aluminum bars. They are from the same famous swedish store. Normaly you attach knives to them and install them in your kitchen. VERY USEFUL! On top of the Containers you can also see my old Hameg scope HM312, my digital weighing machine and my computer attachable microscope. 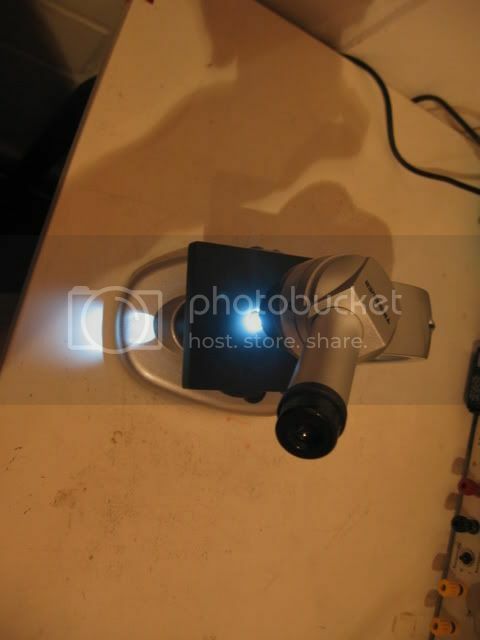 The microscope is very practical to inspect solderpoints or etched PCBs. It has a built in webcam so you can see the picture on your pc-screen. I recogniced thad PCBs aren't transparent, so I had to build a top-light on it. In the containers i also have my DMM, a calculator a self build L/C-meter, savety glasses and some other small tools like a breadboard ,flux dispenser, glue, helping hands and someother stuff. Hmm you can't say much about this. After killing my first PC with about 1500A on the serial port i optocoupled the lines so nothing can happen. The optocoupler-box can't be seen. It's behind the monitor. To get a matrix-operator-like feeling i installed 2 switches were i can switch between the AVR, the PIC and the CPLD burner. And for the serial port i can switch between the reflow ofen, an i2c-serial adaptor and two different serial lines lying on the table. On the table are two power supplys. 0-30V/5A and and 0-15V/2A. Nothing special. Behind the monitor are also 3 normal 220V/16A power lines. They are secured with a residual-current-operated protective device. Ok this is the third time IKE...��h the famous sweedish furniture store comes into buisness. I installed a lamp with a bendable foot in the table. You can bend it nearly 360�, so if you want to light directly into your face, you can do it... but i usually use it to light PCBs lying on the table or to inspect a circuit. Over my Bench is a small shelf with technical books and catalogues of distributors. What you can't see is all the PCB etching stuff. I store all this stuff in the cellar, because i sleep/live in the same room. I can't believe but it is unused! 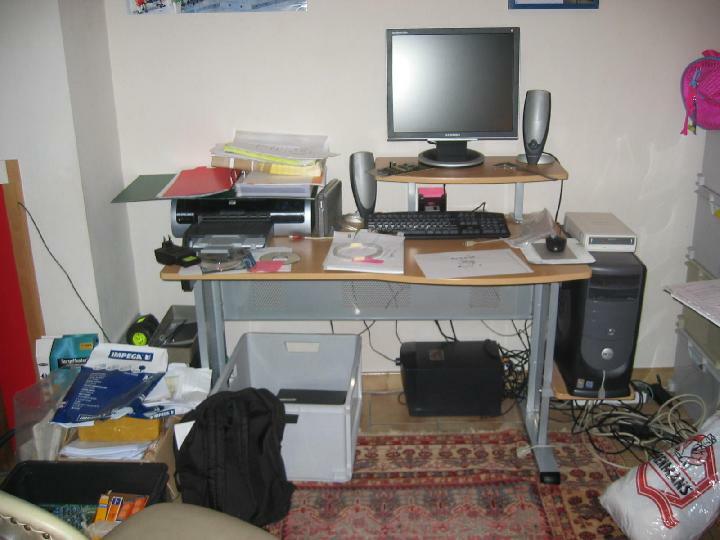 I�m a 20 year old student of Electrical Engineering from Belgium. 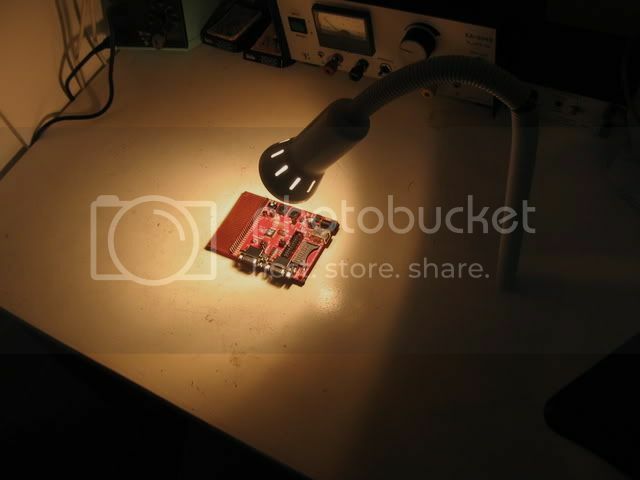 I�ve been an electronic hobbyist for about 4 years now, I used to have a real messy table that served as a workbench, but things have changed�luckily. 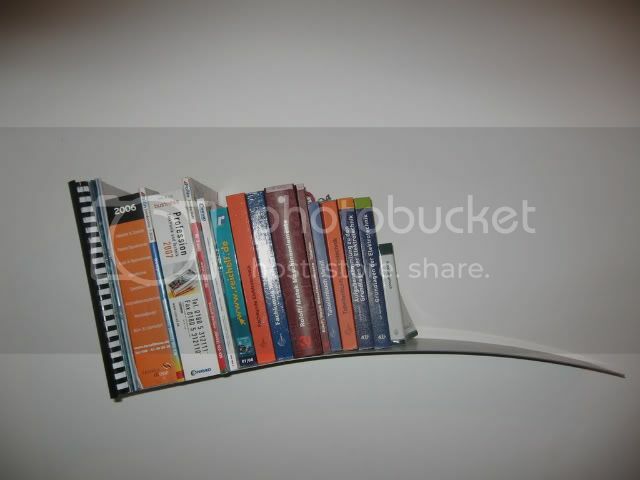 It�s just a normal table with an extra �shelf� on top of it. 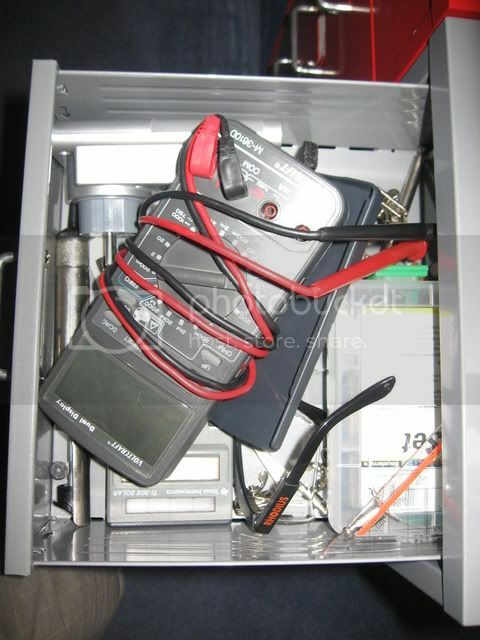 You can see my 3 DMMs, power supplies (2X 30V 2A and a converted PC PSU) and simple functiongenerator on top of it. (I recommend using this or something similar, with multiple levels, to hold your tools). On top of that is a box of pieces of wires, a box with motors and a box with switches. I really recommend using shelfs like this! I�m even thinking about making another one to put on top of it. I made this extra shelf so I could have some more useable workspace to work on projects. The only things that remain on my workspace are the usual stuff like pencils, a garbage bin (another converted PC PSU), two solder irons and ofcourse lots of electrical outlets! My lighting is just a normal Desklight, but with a 100W bulb. It has short-circuit and overcurrent protection (16A) and a 30mA loss switch. All my outlets on my workbench are connected to this thing, and it has saved me from having to go to the garage a few times� I recommend it! 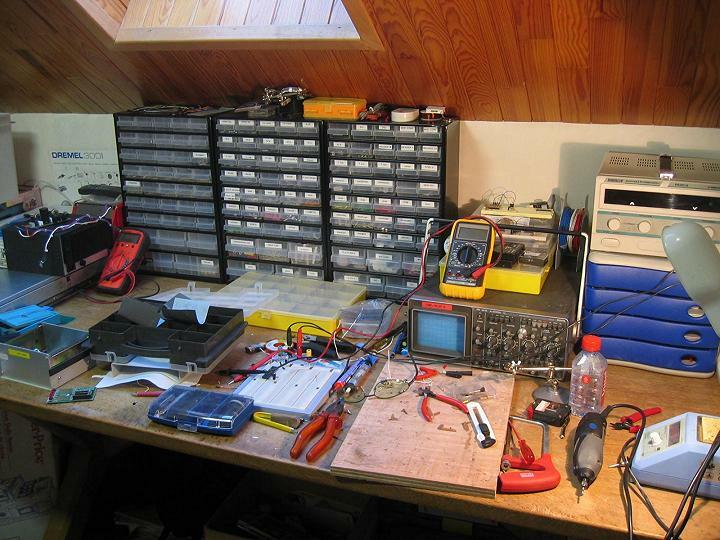 On the left you can see my 2x20MHz oscilloscope, two 60V 1A Power supplies, and my stash of screws and bolts. In the middle you can see my storage of electronic components, with a CCFL light from an old scanner that serves as lighting. And on the right some old PCBs and other stuff. Just storage of old appliances I keep to scavenge from, a box of transformers (not the robot toys XD), a box of batteries, etc. In the right closet I have two boxes with cables and wires, and some old mobo�s and other PC parts. The PC section. Used for programming microcontrollers and a little usb/serial interfacing. The "lab" section. This is where I usually am working on my projects. I've got a P3 server which later may be put online or used for my CNC router project (for not etching pcb's all the time). Some days I'm quite lazy and not in the mood for going to my electronics room. For that reason I made some space in my own room. Made some extra programmers. 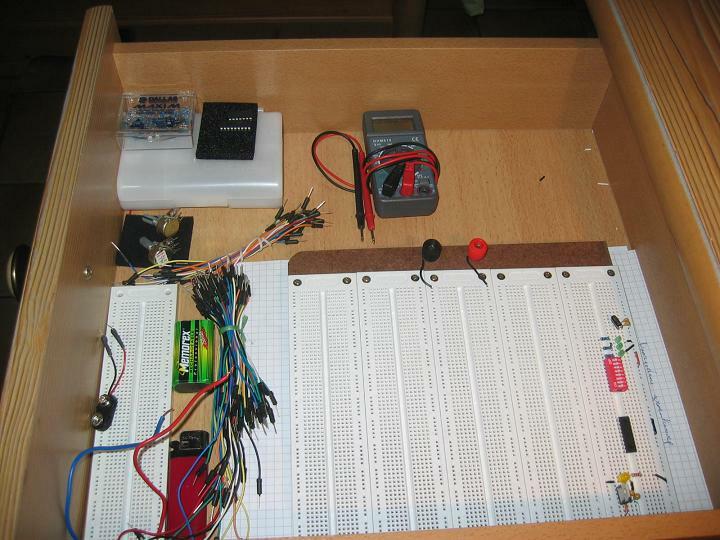 I am working on an extra power supply and a little mix of components. Only thing missing now is the PSU (mini version). 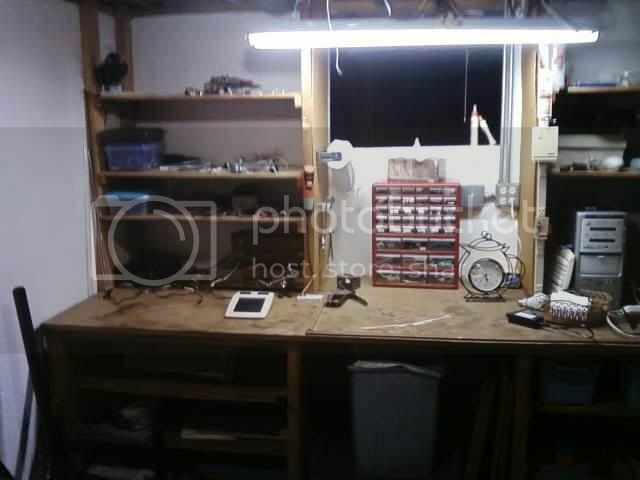 For 9 years, I managed to maintain a workshop in a crawlspace area in a very small house. Thankfully, we've upgraded, and I now have the benefit of a full basement. And like any other pest or rodent, I've expanded to the size of my environment. 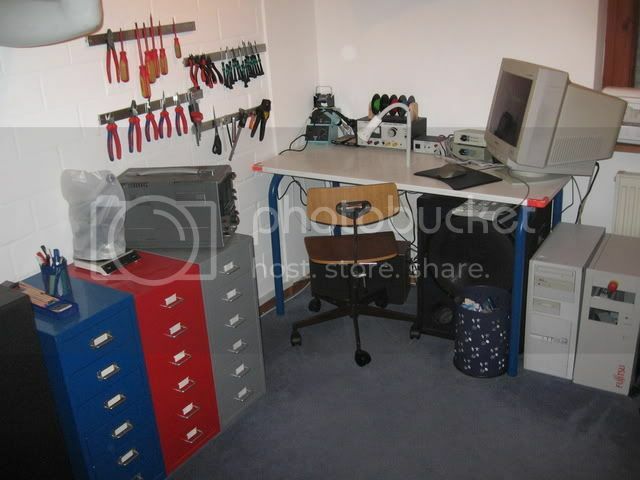 I've arranged my basement workbenches up into logical areas for various "fields" of hacking. The beginning and end of each project starts here. The sturdy open bench and "white-board" allow me to disassemble, study and plan my future projects, listing out goals, approach, brainstorms etc..
Next, my brainstorming bleeds over into the electronics prototyping area. I have an LCD monitor which I've removed the base pedistal, inverted it and re-attached it, so that it could "hang" under a wire shelf to allow more work-bench area. This is configured as an extended desktop from the laptop port-replicator seen on the left. 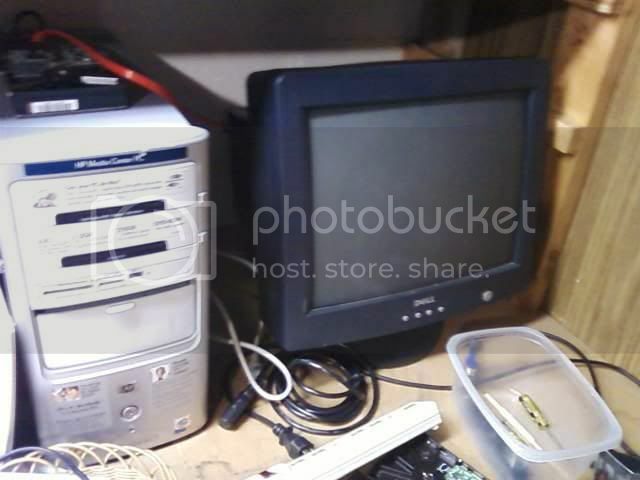 I plan to use a KVM switch to allow me to use this LCD monitor as a "head" for the rack-mount PC case seen under the bench. Two rack-mount adapters have been mounted to the workbench to provide a mounting point for rack-mountable equipment. Sterilite brand containers have been used as drawers after mounting wood sliders for them to slide on. 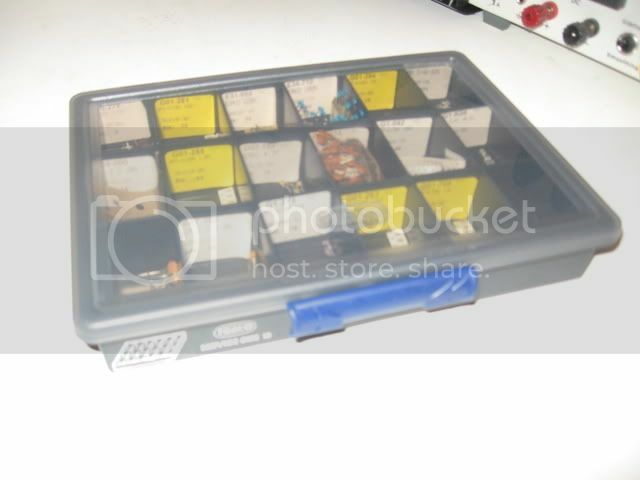 Various other component organizers and drawers systems are used to house components and other projects. I've cut a square hole in the workbench here to countersink my prototyping function generator. This helps to hide the exposed heat-sinks and connectors in order to prevent accidental short-circuits that a messy bench may be prone to. Next is the Soldering and Assembly Workbench. Thanks to some smart ideas borrowed from this site and instructables, I've made a very handy board with machine nuts in 144 holes drilled on 1" centers. Along with some coolant hose, bolts and nuts, it now becomes easy to mount, and hold boards for soldering, and testing. For larger chassis that need work, drilling, sanding, etc, I bring it over to my GP workbench. I keep my power tools here as well. For those special occasions where mounting brackets, small enclosures, bearing assemblies need to be built or modified, I use my (currently messy) metalworking bench. Thank You Harbor Freight. My last major project (Basic Stamp controlled Paintball Marker) that involved most of my workbench areas, also involved this special workbench. It's a new addition in an area that I recently cleaned up. And finally, here's the equipment rack to which my various workbench areas (and the rest of the house) are tied. Electrical is to the right (soon to be upgraded from fuses to breakers. Telephony is behind the rack. Plenty of Cat-5e crossing the ceiling (out of view behind an air duct) and distributed out to various parts of the house. Not shown is my upstairs computer workbench. It's less of a workbench and more of a computer desk, but it's where I write custom code and do some microcontroller work. for electrical outlets there were already 4 outlets mounted under the crawlspace. but we wired in a fluorescent lamp to the lightswitch that was already there, and also connected a really long power strip to the end of the shelf. 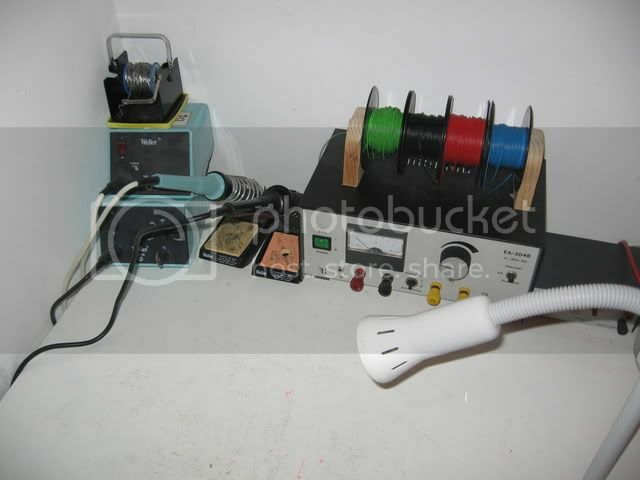 these are various things my father uses for computer repair, i believe he has a splitter somewhere that allows him to switch between a few differant computers to one monitor , but i dont really remeber. 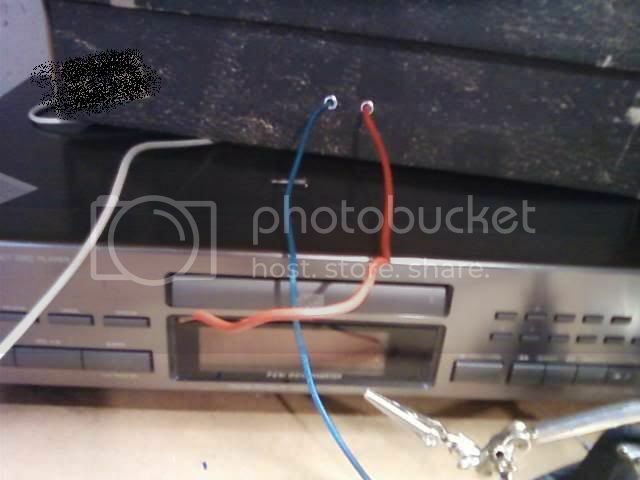 this is part of the stereo system i have been working on so we can listen to music while we work. 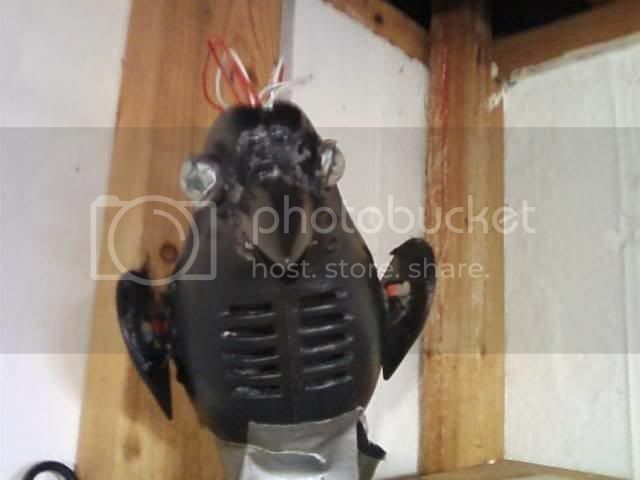 and this is the animatronic halloween toy i hacked to be the speaker for the stereo. works quite good actually. and yes i know that its pretty un-organized, but we only moved in a little while ago and I still havent got any seperators for all my crap.